Scallion, commonly known as green onion, spring onion, or salad onion, is a small onion with long leaves that are considered a necessity in Chinese recipes, as well as in teas, wine, vinegar, honeys, garlic, and ginger. 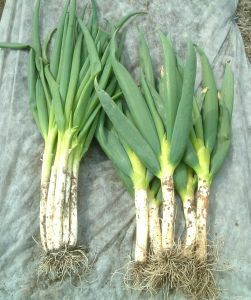 The green onion's medicinal part is its stem. It works as well as an antipyretic, expectorant, anti-bacterial, and anti-fungal. It is effective against colds, headaches, chills to the stomach, indigestion, and also for insomnia. The white stem contains a lot of glucose and allyl sulfides. Use it is a raw condiment to many foods by finely chopping the fresh white stem. For other medicinal uses of vegetables, you may read our article “Traditional Remedies Using Vegetables”. It is mainly used as a traditional medicine for common cold. It stimulates the respiratory tract and helps in expelling sputum (phlegm). It contains essential oils that stimulates the sweat glands and promote sweating. It is rich in sulfur, an essential element that kills or inhibits fungus infections. It inhibits cancer cell growth especially colon cancer. Green onion's anti-colon cancer properties are well known among traditional healers around the world. It contains vitamin A and C. The white part of it has calcium, too. It is a good appetizer. It helps speed up blood circulation and absorbs vitamin B1. This helps reduce stress and tiredness. Cut the green onion's white part into pieces. Put it in a cloth bag and steam it for a hot compress. You can also mix the green onion with grated ginger and some salt. Wrap the hot bag in a towel or gauze and place it over the throat, chest, soles, palms, back, and armpits. It promotes perspiration and lowers the heat and pain. This method is known since the ancient times, and it is as good as commercially sold plasters. Boil the whole green onion for a few minutes. Grind it and mix with a little water just enough to make a paste, and then place it to the swollen part of your feet. This simple method is used since hundreds of years ago by our ancestors. Mash the green onion and make wet cotton with its juice. Place the wet cotton to your nose. Believe it or not, if you cannot sleep well, just place a bundle of green onion beside your pillow. 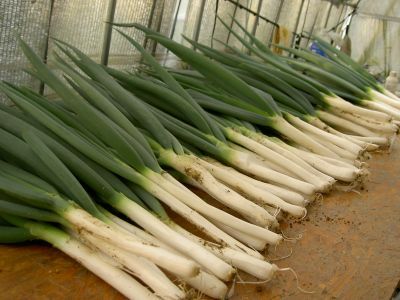 Did you know that green onion eliminates unwelcome smell of fishes and meats, too? How to store green onion? Wrap it in newspapers and place it in the refrigerator. If it has been cut, put it in a poly bag, and place it in the refrigerator. Do you believe that an average healthy person consumes about 100–150 grams of green onion every day? Why don't you try it? We have some information that people who eat green onion daily live healthier than others.